Ancient Egypt was one of the oldest and long-lasting civilizations in world history. This article covers its government, religion, society and culture. For a more in-depth coverage its history, go to the article, Ancient Egypt: History of a Civilization. The civilization of Ancient Egypt is known for its stupendous achievements in a whole range of fields, including art and architecture, engineering, medicine and statecraft. Its great buildings on the banks of the River still strike awe into those who see them. The civilization of Ancient Egypt was one of the earliest in world history. It is usually held to have begun around 3000 BCE, when the lower Nile Valley became unified under a single ruler. At this date the only other people in the world to have a literate, urban civilization were in Mesopotamia. As can be seen, as well as being one of the earliest, Ancient Egypt was one of the longest lasting civilizations in world history. The great days of Ancient Egypt fell between c. 3000 BCE and c. 1000 BCE, but the civilization remained very much a going concern for centuries after this. Egypt was a leading Middle Eastern power again between 612 and 525 BCE, and the Macedonian conqueror Alexander the Great felt the need to have himself crowned as pharaoh in 332 BCE – which suggests that the civilization of the pharaohs still had life in it. His general, Ptolemy, on becoming independent ruler of the country in 305 BCE, was also crowned pharaoh, and his line lasted down to the famous queen, Cleopatra, who died in 31 BCE. Some may regard the civilization of Egypt under the Ptolemies as being more Greek than Egyptian, but the older civilization was still vital enough for the kings to feel the need to present themselves to their subjects in the traditional style of the pharaohs. After that, the Nile Valley became a province of the Roman empire, and was ruled from outside its borders for nearly a thousand years. During this time its culture changed out of all recognition. This period of history, between the civilization’s beginnings in c. 3000 BCE to its conquest by the Romans in 31 BCE, was almost a thousand years longer than the period between 31 BCE and the present day. Egypt is situated in the Nile Valley, in the north east of Africa. 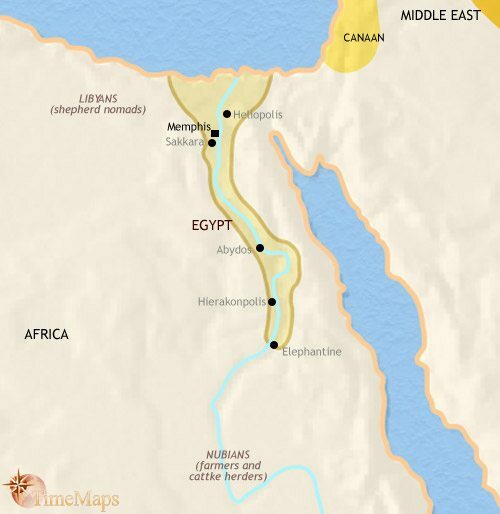 Its origins lay in several chiefdoms in Upper Egypt, at Abydos and Hierakonpolis, which then spread northwards towards Memphis and the Mediterranean. By 3000 BCE, the unified kingdom of Egypt occupied the entire Nile Valley north of a series of rapids called the 1st Cataract (the other cataracts lay in a chain stretching south along the River Nile into present-day Sudan). At its greatest extent, in c. 1250 BCE, Ancient Egypt occupied the land in all directions from the Syrian coast in the north, to the Red Sea in the east, down the Nile Valley to Nubia in the south, and spreading west inland into the Lybian Desert. The life of Ancient Egypt centered around the river Nile and the fertile land along its banks. The farmers in the long, narrow Nile Valley developed irrigation methods to control the flow of the water, so that crops could grow through both its rainy and dry seasons. The valley was fertile and rich, creating vast surpluses of crops that made possible incredible building projects such as the Pyramids and the temples of Luxor. The surpluses were also used to fund a refined lifestyle for the elite; to develop overseas trade and diplomacy; and to pay for wars of conquest. The achievements of the civilization involved innovations in writing – hieroglyphics and demotic; in administration; in quarrying and surveying, maths and architecture; in irrigation and agricultural methods; as well as in developing some of the earliest ships. The Ancient Egyptian civilization produced the first government to rule an entire nation. The Sumerians, who were the only other people to have a literate and urban civilization by 3000 BCE, lived in small city-states, each numbering no more than a few tens of thousand people. The unified kingdom of Egypt, on the other hand, covered an entire country thousands of square miles in size and with millions of inhabitants. The Pharaoh was the ruler of Ancient Egypt, both politically and religiously. The Pharaoh held the title ‘Lord of the Two Lands’, meaning that he ruled all of Upper and Lower Egypt; and ‘High Priest of Every Temple’, meaning that he represented all the gods on all the Earth. In Egyptian eyes, the pharaoh was a god himself, who stood between heaven and earth. His personal welfare and the welfare of the entire people were bound tightly together. Pharaoh was in charge of the army, and would go to war when his lands were threatened – demanding valuable gifts from the conquered people if victory was obtained. To help the Pharaoh in governing the land, an elaborate organization of officials, scribes and overseers – the world’s first civil service – developed, bringing the reach of government down to the lowliest villager. Egypt was divided into nomes, which were administrative regions (up to 42 of them), each governed by a nomarch. Pharaoh himself was surrounded in his palace by high officials, ministers and courtiers. For much of Ancient Egypt’s history the Pharaoh was served by a powerful chief minister called a Vizier. He represented the Pharaoh in the administration of the land, treasury and legal system. Temples were used as places of worship and also as granaries and treasuries where grain and goods were stored. Soldiers of ancient Egyptian armies were armed with bows and arrows, spears, and round-topped shields made from stretched animal skin over wooden frames. Weapons and armour continued to improve after the adoption of bronze: shields were now made from solid wood with a bronze buckle, spears were tipped with a bronze point, and the bronze Khopesh – a hook shaped slashing weapon – was introduced. In the New Kingdom, chariots became a standard part of the army. Pharaohs are often shown riding at the head of the army. Modern scholars tend to think this may be a propaganda device, as for a commander-in-chief to be fighting in the thick of the action alongside his troops would not necessarily have been the best place for him to be. On occasion, however, he may well have done; many commanders in subsequent history have charged into battle in person when conditions called for this kind of example. What is not in doubt is that being the commander of the army was an important part of the Pharaoh’s role. The prime duty of the army was to defend Egypt against foreign invasion. It was also at times deployed in conquering and occupying foreign possessions, in protecting mining expeditions to the Sinai and Nubia, and in garrisoning forts along important trade routes, especially in Nubia. The ancient Egyptians worshipped many gods and goddesses. These included Ra, the sun god; Isis, the goddess of nature and magic; Horus, the god of war; and Osiris, the god of the dead. The pantheon of gods and goddesses gradually changed over time, as new gods became more important, and some less so. The rise and fall of gods and goddesses seems to have mirrored the political fortunes of the different temples and priesthoods. For example, when the rulers of Thebes became kings of all Egypt, and founded the New Kingdom, its local god Amun became the chief god, and was united with Ra to become Amun-Ra. Gods were worshipped in temples run by priests. These were not apparently places of public worship: the place where the god’s image was located was usually sealed off from the outside world. Only on occasions was the god brought out and shown to the public. Small domestic statues were used by normal Egyptians to worship the gods and goddesses in their own homes. Charms and amulets were worn for protection against the forces of evil. Egyptian religious beliefs about the afterlife also changed over time. In early times, the afterlife seems to have been intimately connected to the preservation of the physical body by mummification. This always retained some force. However, the idea grew up that human beings are composed of both physical and spiritual aspects. After death, the latter lived on. Some people become disembodied souls, or ghosts, wandering the earth; but if judged worthy, a person could become a “blessed one”, living in a land of goodness and plenty. As with all pre-industrial civilizations, Ancient Egypt’s economy was based on agriculture. The great majority of the people were peasant farmers. Because of the fertile nature of the Nile Valley, they were able to produce the large surplus which sustained the refined lifestyle of the Pharaoh and his court, his officials, the priests and all the other members of the elite. Peasants also provided the mass labour which built the pyramids and temples along the Nile Valley. Farming in Egypt was dependent completely on the Nile River. Just a few miles away from the river, on both sides, was bone dry desert. The flooding season lasted from June to September, depositing a layer of wonderfully fertile silt on the land beside the river. As much as the flood water as possible was stored in tanks and ponds. After the flood waters had receded, the growing season lasted from October to February. Egypt receives very little rainfall, so farmers irrigated their fields with river water from the reservoirs, and from the river itself. Ditches and canals carried the water to the fields. Trade inside Egypt would have been greatly aided by the presence of the River Nile, and by the fact that no part of the country lay more than a few miles from this great waterway. Until modern times, for anything longer than very small distances, water transport has always been much less expensive than land transport. Numerous towns dotted the river bank, centres of local administration, and of local markets. Egypt has often been regarded as a civilization without cities. This is not true. Unlike the Sumerians, Egyptian cities were not independent states; however, there were numerous urban settlements in the Nile Valley, and Memphis was one of the largest cities in the world, if not at times the largest. In the Bronze Age, international trade was almost the same as diplomacy, taking the form of exchanges of “gifts” between rulers. The Egyptians were ideally situated to take full advantage of this. Before the development of long-range trade routes across the Sahara, the Nile Valley functioned as the only “pinch point” through which trade goods from sub-Saharan Africa could flow north to the Mediterranean. Trading expeditions ranged far south into the present-day Sudan and the Red Sea in search of exotic goods such as ivory, gold, ostrich feathers and black slaves. These highly valued commodities underpinned Egypt’s influence in the international world of the Bronze Age Middle East, finding their way to Hittite, Syrian and Mesopotamian courts. Egypt is rich in mineral resources, and these were well exploited in ancient times. Limestone and granite quarries occurred along the Nile valley. In the eastern desert was mined porphyry, alabaster, carnelian and emeralds. There were extensive gold mines in Nubia. Copper smelted from malachite ore mined in the Sinai. Iron deposits found in upper Egypt were utilized in the Late Period. Many of these minerals were to be found in distant, inhospitable locations in the eastern and the Sinai deserts. They required large expeditions to get at them. These were organized by the government, and often had to be protected by troops. However, these natural resources allowed the ancient Egyptians to build monuments, sculpt statues of all sizes, manufacture metal tools and fashion jewellery. As in all societies of the ancient world, peasant farmers made up the bulk of the population. However, the land was owned by the Pharaoh, or by one of the temples, which were immensely wealthy, or by a noble family. Peasants were also subject to a labour tax, and were at times required to work on public projects such as irrigation or construction works. Craftsmen seem to have had a higher status than farmers. Most of these probably worked for temples or the state. Scribes and officials were of high rank in ancient Egyptian society. Within this elite group were also priests, physicians and engineers; and from them were drawn the leading priests, ministers and courtiers. At the very top was the royal family, below which was a powerful class of hereditary landowners (nobles). Slavery was known in ancient Egypt, but its extent is unclear. Most slaves seem to have been used as domestic servants in wealthy households rather than as agricultural workers. By law, slaves were able to buy and sell, like other people, or work their way to freedom. Women seem to have had a comparatively high status in Egyptian society. Like men, they could own and sell property, make contracts, marry and divorce, receive inheritance, and pursue legal disputes in court. Married couples could own property jointly. Some women enjoyed huge status as high priestesses. On the other hand, as in virtually all ancient societies, public office was almost always reserved for men. The first hieroglyphic writing that has come down to us dates from c. 3000 BCE. A hieroglyph can represent a word, a sound, or a silent determinative; and the same symbol can serve different purposes in different contexts. Egyptian hieroglyphic writing is composed of hundreds of symbols, which could be read in rows or columns, and in either direction (though in the majority of cases, written from right to left). Hieroglyphics were, as far as we know, exclusively used on stone monuments and in tombs. In their daily work, scribes used another kind of writing, called hieratic. This uses a cursive script (that is, joined-up writing) which was far quicker and easier to use than hieroglyphics. Hieratic writing was always written from right to left, usually in horizontal rows. Later, around 500 BCE, and therefore towards the end of Ancient Egyptian civilization, a new form of writing, Demotic, came into widespread use. This was a phonetic, semi-alphabetical script, which began life as the transcription of everyday spoken language, but over time developed into the language of literature, high culture and religion. Egyptian hieroglyphic literature is found on public monuments, and the walls of temples and tombs, and consists of records of the deeds of gods and men, as well as poetry. Love poetry, hymns, proverbs, spells and curses, instructional and medical texts, and myths and legends, are found in hieratic, and later demotic scripts. One of the best-known examples of Egyptian literature is a collection of spells dating to the New Kingdom period and labelled the “Book of the Dead”: its object is to enable people to pass successfully from this life into the next. The Story of Sinuhe is probably the best known work of Egyptian literature that has come down to us. Another popular tale is the Story of Wenamun, which gives an insight into Egypt in its declining phase. Much of the art which has come down to us is funerary art – art designed for the tomb. The Ancient Egyptians believed that life could continue into the afterlife, and so the dead were accompanied in their graves by everyday and luxury goods – including art objects – to help them enjoy their new life. Ancient Egyptian art emphasised a rigid style which changed remarkably little over the millennia. This did not mean that Egyptian art was unchanging – but change took place within fairly narrow bounds. Ironically, in the declining centuries of Ancient Egyptian civilization, its art became more conservative and rigid, harking back to the glorious days of old. The iconic Egyptian two-dimensional style is found in tombs, temples and statues. Egyptian statues were carved from stone and rock, or wood as a cheap alternative, with paint obtained from mineral ores quarried from surrounding areas. The wall paintings in tombs often depict lively scenes of everyday life, bringing this ancient civilization vividly to life. The houses of the wealthy also had richly painted walls with scenes of people, birds, water pools, deities and geometric designs. The Ancient Egyptians built some of the most-awe inspiring structures the world has ever seen, such as the Pyramids of Giza. The construction of pyramids was in fact restricted to the earlier days of Egyptian civilization. Later monumental architecture can be seen most clearly in the temples and giant statues of the Valley of the Kings and Abu Simbel. The average Egyptian lived in a simple mud, wood or brick abode, with the elite having elaborate multi-room mansions with richly painted walls, decorated floors, and built around courtyards. The Ancient Egyptians developed high levels of mathematical skills to enable them to build their pyramids and temples with remarkably simple tools. There mathematics seems to have been of a more practical nature than that of the Mesopotamians, and therefore may have influenced later civilizations less; however, this practical mathematics must have been of a very high order indeed. Ancient Egyptian funerary practices, which involved embalming the dead, did not lead to detailed knowledge of human anatomy. Nevertheless, Egyptian medicine acquired an excellent reputation in the Ancient World. Ancient Egyptian doctors could stitch up wounds, repair broken bones and amputate infected limbs. Cuts were bandaged by raw meat, linen, and swabs soaked with honey. Opium was also used as a painkiller. Onions and garlic were used as health foods in the diet. Close proximity to the Nile meant that water-borne diseases, such as malaria, were rife. Other common ailments included physical stresses caused from a life of labour. Life expectancy was between 30 (women) and 35 (men), however about one third of infants never reached adulthood. The long river along which Ancient Egyptian civilization flourished was an ideal environment for the development of boat technology. As early as 3000 BCE an Egyptian ship of 75ft in length had been built. Planks of wood were originally held together by straps, with reeds or grass pushed in to seal the gaps. Soon tree nails were used to hold planks together, with pitch and caulking to close the seams; and mortise and tenon joints had also been developed. However, despite having ships on which to sail, they were not renowned as great sailors and do not seem to have engage in shipping across the Mediterranean or Red Seas on a regular basis. The clearest evidence for the legacy of Ancient Egypt can be seen in architecture. The later Egyptian temples look very similar to early Greek temples; and it has been suggested that the Ancient Greeks got the very idea of monumental building in stone from the Egyptians. Other items of Egypt’s legacy are harder to pin down. Archaic Greek sculpture seems to be more closely related to Mesopotamian and astronomical models than Egyptian; similarly, Greek mathematics bears a closer relationship to Babylonian precedents. What is unmistakable is that this ancient civilization has exercised an unmatched spell upon future civilizations. The Greeks already regarded Egypt as a land of wisdom and mystery, and the Ancient Roman fascination with Egypt can be seen in the number of obelisks to be found in the city of Rome to this day (some of them shipped from Egypt to the imperial capital, others copies of Egyptian models). The medieval Arabs wrote about Egyptian civilization, and the modern European fascination with Egypt was fuelled by Napoleon’s conquest of the country in 1798. Modern Egyptology started at that date, and has continued ever since. Today, Egypt is one of the prime tourist destinations of the world, witnessing to the ongoing fascination with this, one of the world’s truly great civilizations. So what, in sum, is the place of Ancient Egypt in world history? It is surely this – here, almost at the very beginnings of recorded history, was a great civilization which produced wonderful art, architecture, engineering, literature, medicine and so on. The wide range of highly-developed practical techniques these involved were transmitted to other peoples and later cultures; but more than this, what an inspiration it must have been for the civilizations which came after! We know that many Greeks and Romans travelled to the land of Egypt, and were awed by the magnificent remains they saw there. In short, Ancient Egypt set the bar high!